These drinks are like children to us: We feed them organic ingredients and dress them in the finest labels. Fortunately for you, our family is always growing. The one that started it all. Handcrafted soda made with extracts of wintergreen, clove and anise. All our recipes are sweetened with Fair Trade Certified Organic sugar, so you can feel good about it! A lighter-bodied brother to our super popular Root Beer. The flavor profile has less clove, allowing the taste of wintergreen to be showcased. Soda fans agree, it’s the best they have ever had! In Maine we wait all year for the blueberries to grow. It’s a real summer treat. 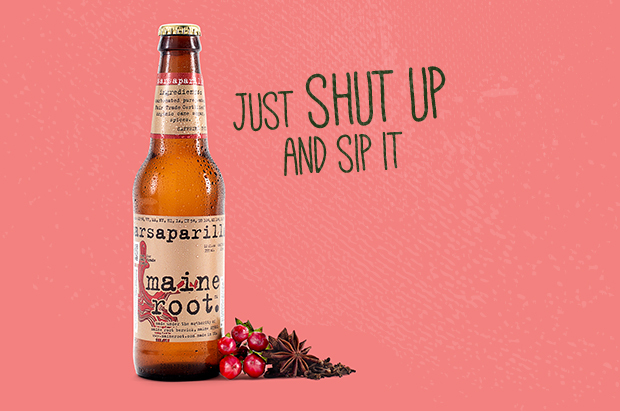 Crack open a bottle of Maine Root Blueberry Soda and see what you have been missin’ mistah. The Deathstar is complete. We added our latest flavor after many requests for a third brother to our fruity offerings offerings. Here it is, Mandarin Orange! Light, drinkable and thirst quenching. Mmm. Our take on a classic flavor. We travelled the world for years trying to find inspiration. Give our cola a try and you will soon be thinking about having another. Wouldn’t it be nice? Our recipe lets the WICKED spicy flavor of the ginger root loose to mingle with pure organic evaporated cane juice, purified water and HAPPY BUBBLES! Wicked good. A friend of ours named his ice cold bottle of Lemon Lime, Mr. Happy. We agree. The cool and refreshing taste of lemons and limes will make just about anyone grin. Go find your Mr. Happy! It doesn’t have to be autumn to appreciate this delicious beverage. We’ve bottled the flavor of everyone’s favorite gourd-based dessert for your year-round enjoyment. You’ll be thankful you tried it. Sorry, kids. We weren’t trying to run you out of business. We were just trying to make the best lemonade anyone has ever tasted. Judging by all the awards we’ve won, we succeeded! Sweetened with Maine-harvested maple syrup good enough to make a mountie blush. It’s also the winner of Natural Products Expo East 2010 New Products Showcase Award. Subtle flavors of ginger and lemongrass mix with Fair Trade cane juice to alleviate the boredom in any glass. Try a bottle of this award-winning beverage and call us in the morning.